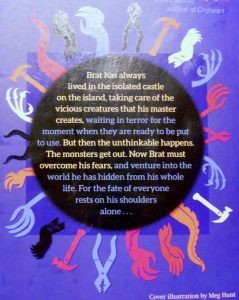 Brat has always lived in the isolated castle on the island, unwillingly taking care of the vicious creatures that his master creates. But then the unthinkable happens. The monsters get out. Now Brat must overcome his fears, and venture into the world he has hidden from his whole life. For the fate of everyone rests on his shoulders alone. . .
Just have a look at that cover – fabulous, isn’t it? Meg Hunt has conjured up lots of quirkiness, eyeballs, tentacles and colour. Exactly right for a book with monsters, peril and humour. Did you notice the stitches? Clever – when the story is (loosely) based on Frankenstein. What you can’t see is the sheen on the rain and lightning. I’d say that, together with the warmer colours, suggest the hope that pulls you through the book. Now read that tagline: The hardest monsters to fight are the ones inside ourselves. Such a brilliant topic for discussion. Our hero* is a classic underdog battling both the effects of years of being demeaned, and now real monsters. But Brat is not alone – he has Tingle and Sherman. The value of friendship is strong in this book. Perfect for its young readers. I can’t help it, but as a teacher in a previous life, I delight in books that have creative possibilities. There are lots here: both Art & DT in creating ‘monsters’, fabulous creative writing in describing and naming new ones, Drama in acting them out, and Geography involving islands and tunnels, deserts and rivers. All good stuff for school or home. If you loved Mold and the Poison Plot as much as I did, you’ll be thrilled by The Maker of Monsters. It’s not a sequel – but has as much adventure, heart and downright great writing as Lorraine Gregory’s début. That ring of limbs and tools – you’d have to make something out of that! 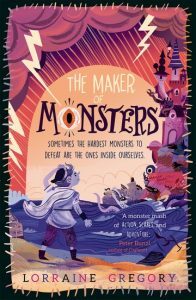 This entry was posted in Review and tagged #writersreviews, Lorrraine Gregory, Maker of Monsters, OUP by KMLockwood. Bookmark the permalink.